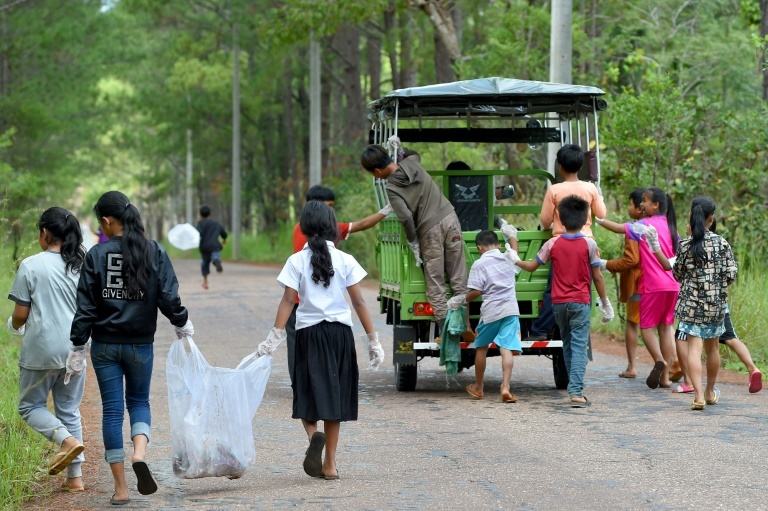 Plastic waste as registration costs: at the top of a mountain in a lush national park, a small school was built of tires, bottles and packaging that students collect to study. Roeun Bunthon, a former street child, is one of them. "I stopped begging, it's like having a second chance," says the 12-year-old, taking notes during an English class. Sun Sreydow, 10, hopes that this learning allows her to fulfill her dream of becoming a doctor. Coconut School is located almost one hundred kilometers from Phnom Penh, in the heart of the Cardamom range, and is built almost entirely from waste. The walls were built with painted tapes, the roofs with plastic bottles and hundreds of colorful capsules sign the national flag at the entrance of the establishment. Opened in 2017, it does not replace the public school that children still need to follow, but completes teaching in different subjects – English, Mathematics, Khmer, Computer Science – while students are taught students to recycle. The goal of Ouk Vanday, a former hotel manager behind this initiative, is twofold. The first is to offer additional training to the most disadvantaged children in a country where they are often sent to beg to help support their families. Supported by voluntary teachers and donations, Coconut School, which accommodates about 60 students, "does not ask for money, even if it is not free", says Ouk Vanday. To pay the admission fee and pay the monthly amount, the students bring along plastic packages that will be used to enlarge the establishment. "I always say to the children, give me trash and I will give you instruction," says Ouk Vanday, 34, who started a first school of his kind on an island near Phnom Penh in 2013. The aim is also to prevent the proliferation of waste, while the small Southeast Asian country produced 3.6 million tons in 2017, according to statistics from the Ministry of the Environment. Only 11% of the waste is recycled in the kingdom, 48% is incinerated or dumped in rivers, the remainder is transported to landfills or landfills in constant expansion, creating major health and ecological risks. Ouk Vanday believes that it can take 10 to 15 years for Cambodians to become aware of these problems, but hopes that his students will help change. "These young people will become new (environmental) activists in Cambodia, who will understand how to use, manage and recycle waste," he says. In the meantime, he has several projects in mind. He wants to build recycled waste, including used tires, a replica of the famous Angkor Wat Temple and open "a museum of waste". It also plans a school in 2022 that floats from garbage thrown in Tonle Sap Lake near Siem Reap (center), the largest freshwater lake in Southeast Asia. As far as Coconut School is concerned, a nursery class will open next year and the school hopes to welcome around 200 children soon.